Mountain Brook Police Chief Ted Cook. Journal photo by Maury Wald. Unlike some in his profession, Ted Cook admits that he enjoys watching police procedural dramas on television. Cook probably gets enough realism in police work every day. As chief of police in Mountain Brook for the past five years, he has been tasked with running one of Alabama’s most respected law enforcement agencies. While every municipality provides unique challenges, Cook said a police officer’s job is difficult even in the best of circumstances. The recent months have been a difficult time for law enforcement as a rash of recent police shootings – some resulting in the deaths of officers – have grabbed headlines across the county. Cook, like many in his profession, is concerned about the future of the profession in modern America. 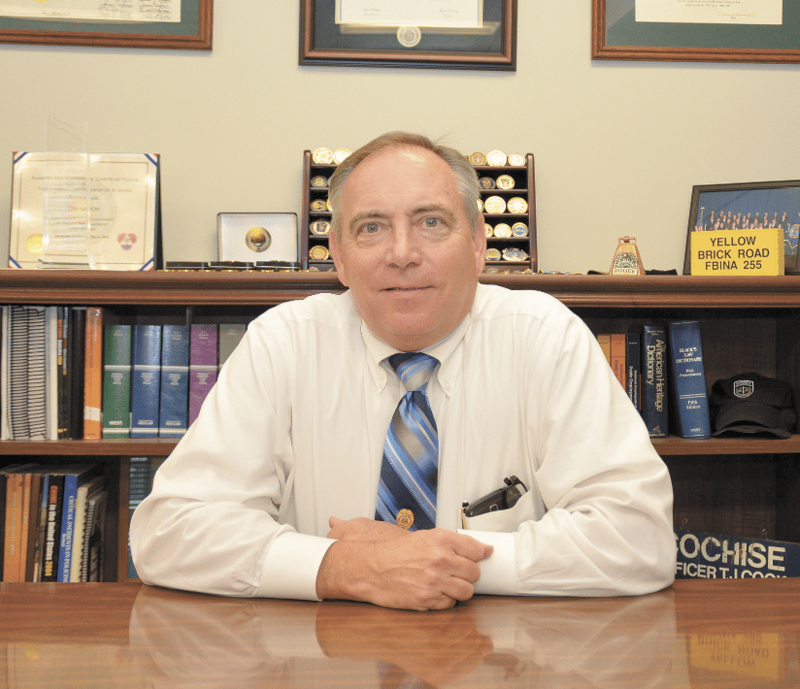 Cook became chief of police in Mountain Brook in 2011, climaxing a distinguished career that spans three decades. A graduate of Homewood High School, he decided upon a career in law enforcement as a teenager. After earning a degree from Auburn University, Cook worked with the Birmingham Police Department in a variety of capacities, including SWAT operations and mounted patrol. But one tragic date will never leave his memory: June 17, 2004. Cook was the lieutenant of the day shift when three police officers were shot and killed in Ensley. Cook, 55, served as chief of police of Leeds for three years before moving over to Mountain Brook. Cook is confident that his police unit – which numbers nearly 60 officers – is ready for the challenges of the 21st century. Mountain Brook’s officers are among the best-trained in the state. In addition to the 14-week training program at the Alabama Police Academy, the city’s police cadets must also complete Mountain Brook’s own comprehensive 14-week regimen. Mountain Brook’s citizens clearly appreciate their police department’s work. Like many residents of other cities, Mountain Brook residents regularly bring food and cards with encouraging notes or other expressions of gratitude to the Police Headquarters in Crestline Village. Cook’s personal plans do not call for a change in the foreseeable future.